Among the various experiential retail demos on the trade show floor at this year’s SXSW festival and conference in Austin, a mobile activation by Lush stood out among the crowd to mark the brand’s debut appearance. 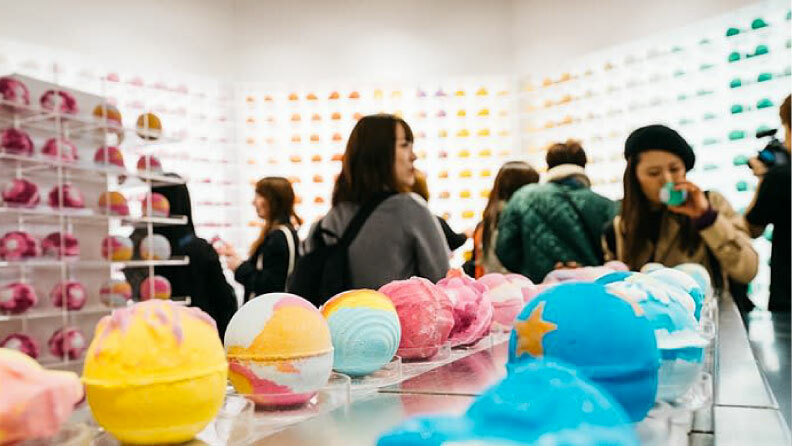 From using conveyor belts to transport and showcase 54 bath bomb products, to a featured QR code prompting guests to download the informational and transparent Lush Labs mobile app, the beauty and cosmetics brand showed up and showed off with various user-friendly activations. The aforementioned QR code was created as a waste-free educational tool, digitally leading viewers to information including product name, ingredients, price and a video of what products look like when dropped into water. This feature was intentionally created to help eliminate both product and water waste, and decreases the need for in-store demonstrations. "We really want to integrate reviews on our platform along with social content," said Adam Goswell, Lush's head of technology research and development, to Mobile Marketer in an interview, according to Retail Dive. "There's an amazing amount of social content they bring in that's probably better than our own. The customers share how they use it, details about products and personal comments… When we put Lush Labs into our main shopping app, you would expect it to recognize anything you can physically see in the shop." Learn more about Lush and SXSW here.